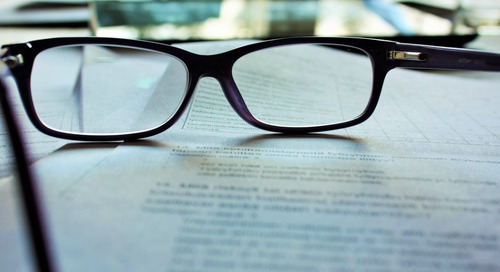 Many organizations, particularly large enterprises that deal with thousands of documents a day, are reaping benefits by scanning inbound paper as soon as it arrives and placing it in a digital workflow. Respondents to surveys conducted by AIIM (the Association for Information and Image Management) have reported numerous benefits from transforming paper processes to digital. 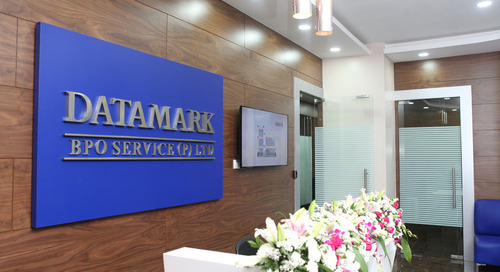 They include an improved speed of response to customers by six times or more; a saving of nearly 8 percent of office space within 5 years by eliminating the need to file paper; and a ROI on paper-free projects of 18 months or less for more than half of respondents. Start with one paper-based process. 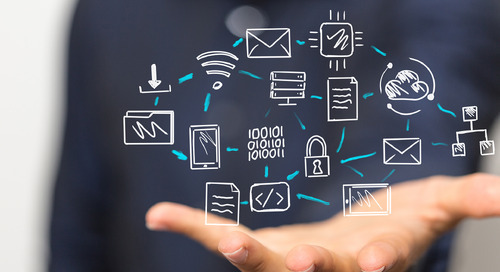 Business process ripe for digital transformation include accounts payable (AP), accounts receivable (AR), and records management. Gain buy-in for your pilot paper-free project from senior and C-level managers. 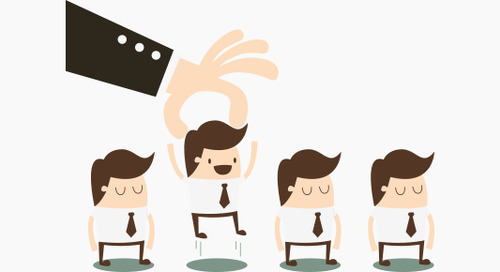 Bring an experienced project manager who understands the “fine art” of organizational change management onto your team. 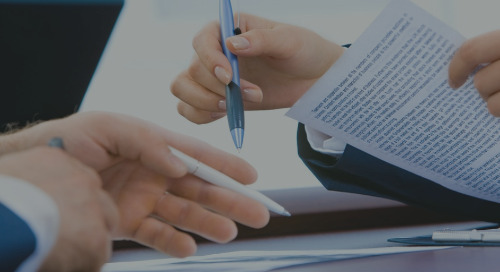 Audit the process to see where paper slows down or bottlenecks the workflow. Common “speed of paper” slowdowns include printing, signing, routing and storage and retrieval. 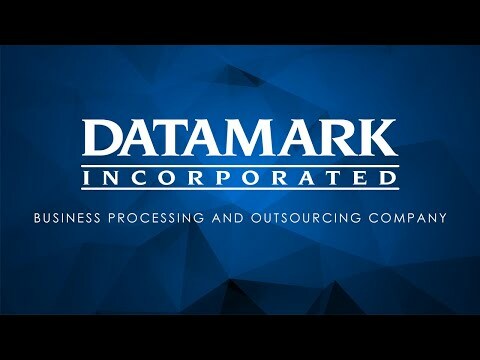 For complex processes, consider the services of business process improvement experts, such as DATAMARK’s Business Engineering team. 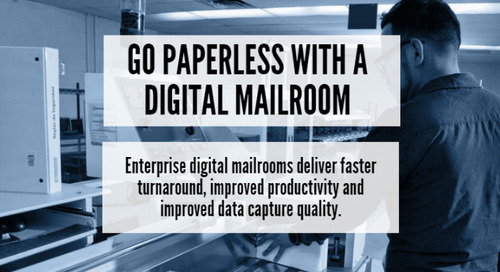 Examine the benefits of centralizing the reception of mail at one site, where inbound paper documents can be scanned and digitized quickly and efficiently right at the entry point of the business process. Large enterprises that deal with thousands of inbound documents daily should consider outsourcing the mailroom process to control capital costs and eliminate the staffing headaches that come with fluctuating volumes. 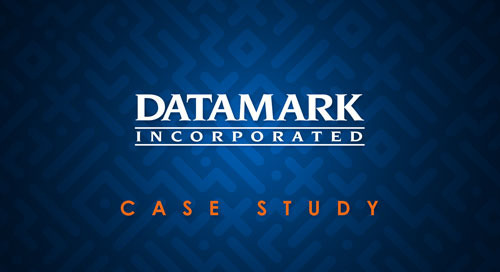 DATAMARK is an experienced provider of enterprise-level digital mailroom services. Look for opportunities to scan, capture and classify paper documents as soon as they appear in the process. Have scanners available in branch offices, stores, warehouses and factories. Use mobile scanners or smartphones and tablets to capture documents at customers’ locations. Test and evaluate the business case for your pilot project using clearly defined and understandable metrics. 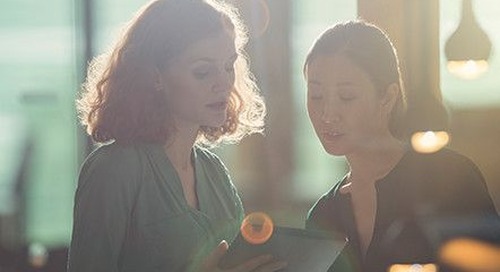 As the project begins to deliver benefits, share the good news with the rest of the organization and be on the lookout for more opportunities to transform paper-based processes to digital workflows. Are you looking for an experienced partner that can help your organization transform the way it does business? 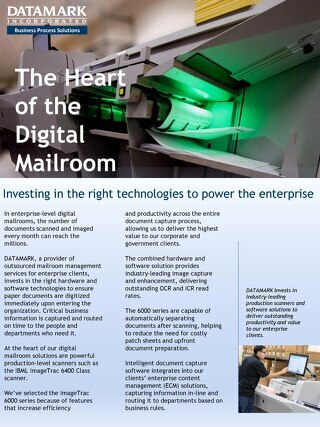 Contact DATAMARK’s digital mailroom and business process improvement experts today.